Based on a true story. 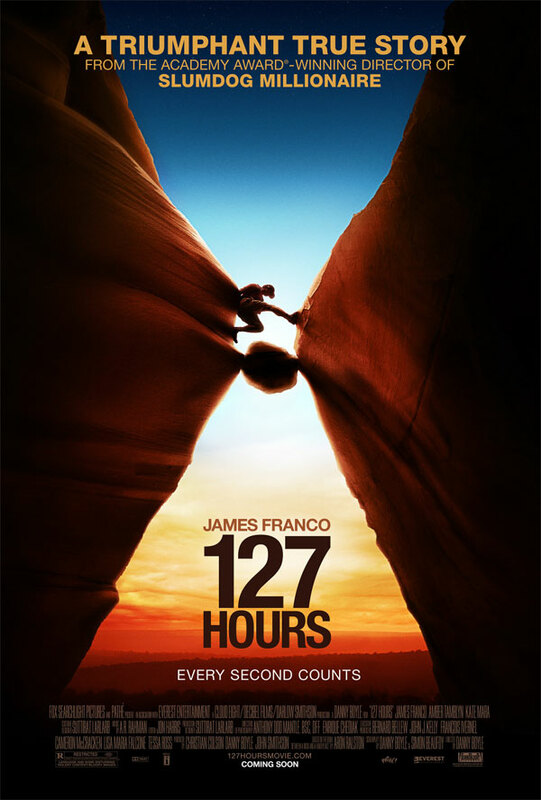 A mountain climber becomes trapped under a boulder while canyoneering alone near Moab, Utah and resorts to desperate measures in order to survive. After reading a short summery of this movie I decided not to see it, as the plot seemed lame and disgusting, but I am glad I still did. For a movie that mostly takes place trapped between a rock and a hard place, this movie is really impressive. You are at all times fully aware of what the young guy is feeling and thinking. I is amazing how this movie takes you around his whole life and mindset while he is just stuck in a canyon somewhere in Utah. This really should be credited to the great acting by James Franco and direction by Danny Boyle. It is clear that this is the same talented guy that directed movies like Trainspotting and Slumdog Millionaire. The visual effects are enormously impressive and you should really see this movie in a movie theatre to appreciate the gradiour of it. I must admit, though, that I suddenly had to check a very important email on my phone while the guy was sawing his arm off (you knew that was going to happen, right?). That was very detailed and visual. This also has an impressive soundtrack by the way. This is not a movie to watch on a romantic date in the theatre. Bring a group of friends you can discuss the plot, life, safety while hiking etc. instead. If you think you're gonna watch a normal movie, let's say normal Boyle movie, you'll be in for a surprise, since this is very different in it's story telling and visuals than most other movies out there. I really liked it. Since it's about a guy who's stuck in the same place for most of the movie, it's mainly build up around what going on inside of Aron Ralston's head. There's some great visuals and the sound design is great as well. Only weak thing is it's strength as well, and that is being a not so ordinary movie in the way it's told!